Be sure you check out Virtual MIDI Keyboard. A very useful program which transforms your computer into a MIDI Keyboard. You can use the mouse or the computer keyboard to play MIDI notes, send MIDI controller data and select programs. 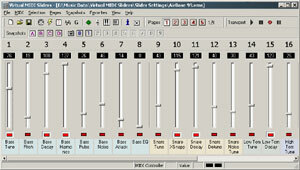 Virtual MIDI Sliders is a MIDI mixer/controller that can be configured freely and can also act as a translation layer for a hardware controller box. 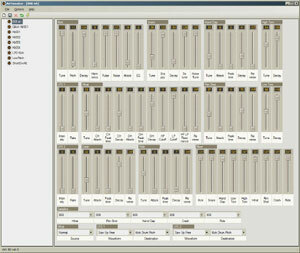 You can also download a freeware Pulse Editor. 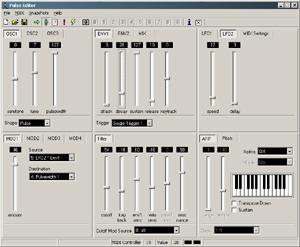 With this program you can control all the parameters of the Waldorf Pulse synthesizer. With AirTweaker you can edit all the parameters of the Jomox AirBase 99 analogue drum module. 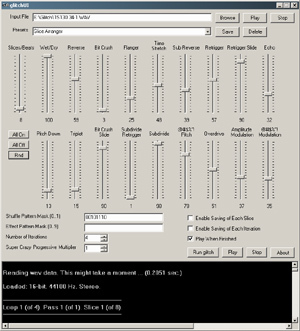 Patmulgen is a drum pattern variation generator for AudioMulch. It has four variation configurations that can have six different variation types. 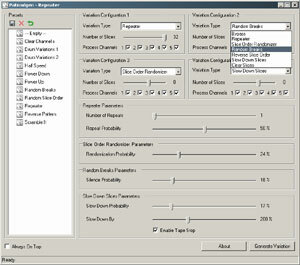 Every variation configuration has settings for the number of slices and can operate on the drum channels one through five. GlitchUI is a graphical user interface for the glitch console application which was made by Kieran Foster. With the Pluggo Categorizer you can categorize your Pluggo plug-ins. With Virtual MIDI Mixer you can create your own midi controller environment, you can create faders, knobs, buttons and menus.